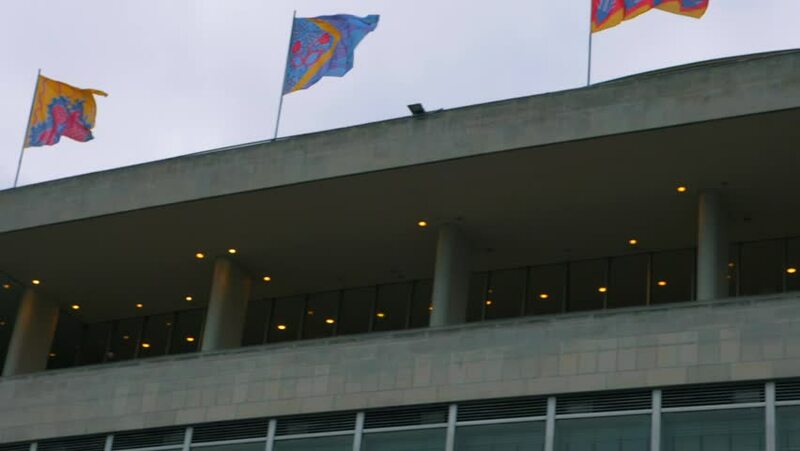 Slow motion view of colorful flags flying on top of a modern building. Cloudy sky background. Pan right. hd00:13BRUSSELS - OCTOBER 23: Side entrance to the European Union (EU) Commission at night on October 23, 2012 in Brussels, Belgium. The Commission has high influence in EU politics. 4k01:30Downtown: Los Angeles, CA USA Set #64 - Right Rear 3/4 View _ Los Angeles, CA USA - Car travels W down Arts District on a sunny day in light traffic. Shot on RED Dragon. hd00:48LONDON - MARCH 8: inside Station on March 8, 2014 in London, UK. It is the station on the London Underground with more passengers each year. 4k00:10Aerial. Kiev metro bridge in cloudy weather. Arched bridge passing through the river Dnieper the left bank. Fog over the river and bridge. Beautiful cityscape with a view of the river and the bridge. hd00:10Dubai, CIRCA October 2015, UAE:: Dubai Airport. Aircraft leaving the airport and going to the takeoff runway.